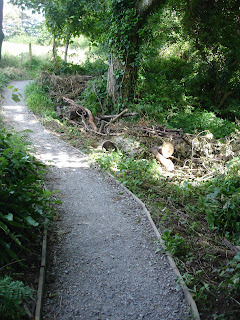 This footpath was driven through one of the few wildlife refuges remaining in Pembroke. The path could have been in the field edge to the left but no destroy more wildlife refuges until wildlife has no where to go. THE ONLY BENEFICIARIES I HAVE SEEN HAVE BEEN WOMEN WITH FREE RANGING UNCONTROLED DOGS so much for the few remaining mammals. 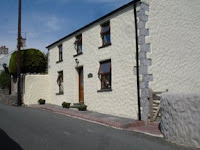 Another photograph of a "modernised" traditional building in a village with limestone walls built direct on the rock. 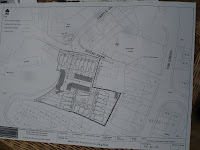 Where is the Planning Officer? Brown fake wood plastic windowa, faux rustic cement render, tile covered limestone bed rock. Impervious paint finish. 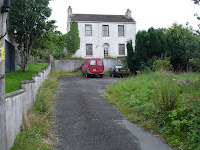 Compare this house with the photograph of the central house number4 to be demolished as part of the Rocky Park Development, you can see what happens to a house in twenty years after PCC enforced modernisation.It has stood for several hundred years. Without major repairs all it is fit for is demolition. On the west bank of the Carew River. 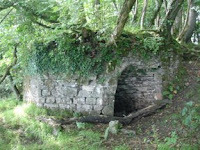 This limekiln is of interest as it is constructed of dressed limestone blocks and built as an octahedron. Unless the trees are removed soon the structure will be destroyed, another part of our heritage will be lost. Until the late fifties until PCC and C21 Mill Pond Commitee finaly ruined it Pembroke Mill Pond and Castle Pond were biologicaly productive . 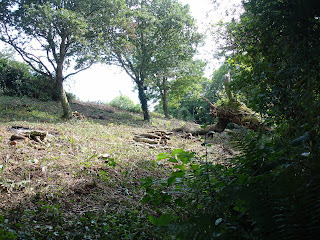 C21 Mill Pond Committee are determined to convert the Mill Pond into Bosherston Lily Ponds. The freshwater supply is inadequate to maintain water quality. 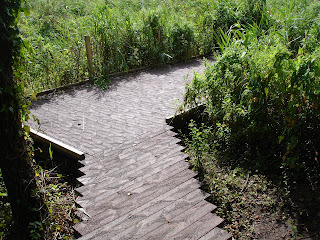 The water arises from boulder clay red sandstone with agricultural run off. The Lily Ponds are supplied by ground water throughfractured limestone and run off from carboniferous limestone. The Mill Pond will never be another lily pond it is a scientific impossibility. For 40 years this idiocy has been imposed, net result pollution eutrophication and stink, a public health hazard. 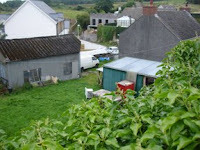 They will never be Bosherston Lily Ponds. 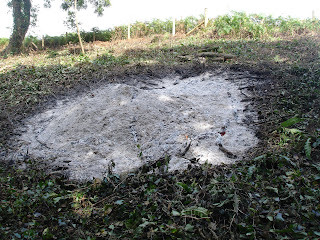 £90,000 of your and my money is about to be spent to complete their environmental degradation. This is a Conservation Area with existing buildings which before the conditions for repair by PCC were imposed were of architectural merit. 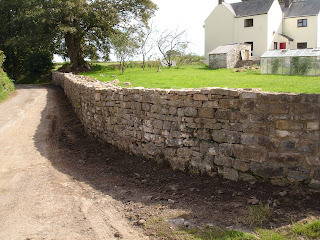 They show why these instructions by PCC were wrong and have led to inevitable destruction of buildings built by the traditional method of limestone field stone with a coarse lime mortar bound core . When covered by an impervious cement render these walls in not many years degrade and will need complete reconstruction. 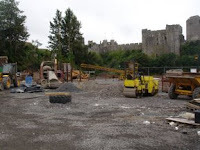 When deliberately neglected and made into a local eyesore by the developers to provoke adjacent property owners to call for their demolition as the following photographs they affect adjacent property values. The rear view in the last post shows the destruction of the structure by imposed repairs. 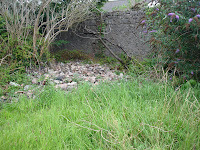 This proposed over development calls for the complete demolition of the site using a small part of stone from the demolished walls, to build low front garden walls. The walls are of ancient origin repaired and bodged over the past two hundred years at least. 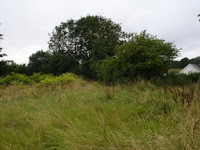 Do we allow almost all the mature trees remaining in this Conservation Area to be felled. 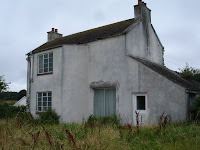 These show the Northern and Southern elevation of no 4 the house CADW ,and PCC say is of no merit. These sites were maintained a used as residences up to a year ago. 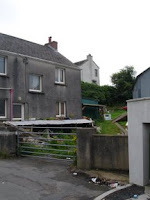 They appear to have been abandonned in assumption that permission would be granted and they would be replaced by twenty five separate properties. This is the third modified application to be applied for. Note the weasel words STARTER HOMES used for all the properties, all will be out of the reach of local people let alone first time buyers. The area is already developed with what five years ago were desirable period houses in a conservation area. 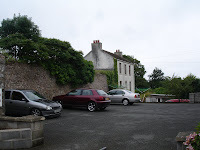 If we look at the history of the site there is little written evidence but it is a carboniferous limestone outcrop at the edge of a settlement which would have been used as a burial ground, shallow one foot excavations in the bedrock originaly covered by a low cairn which was lost centuries ago, the stones being reused for the extensive existing walls, which will be destroyed by the proposed development. Andrea Nc Connel CCW has told me that she acted according to the law concerning SSIs. PCC is less convincing, it appears if developments are carried out incrementaly in very small steps the law cannot be enforced. None of the concerned bodies can take into account the long term intentions of the developer if he or she proceeds in small enough steps. The law protecting the environment is over complex not joined up and full of weasel words and get out clauses. Deliberate draughting policy???? 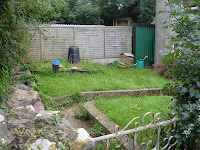 I have been told by PCC that there is now permission for him to tarmac the road contrary to all the opinion give by CCW.